BlackBerry Z10 users have a reason to celebrate today, as the Canadian company started seeding the first major update for their smartphones. 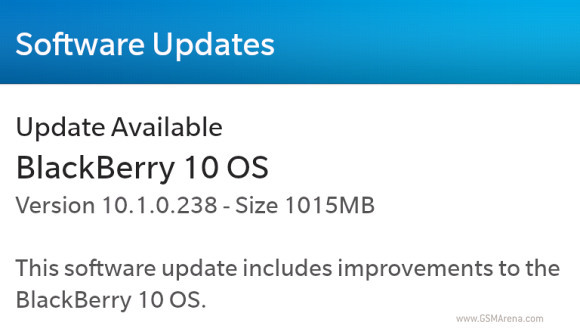 BlackBerry has just started the rollout of the BlackBerry OS version 10.1, which requires a download of about 1GB. We've only received confirmation of the update being available in the Philippines, so far. There is no official changelog provided with this update, but we already knew what to expect thanks to the the previously seeded developers' build. HDR stills, PIN-to-PIN messaging, APN edition, improved BlackBerry World store, improved text picker are among the major novelties brought by BlackBerry 10.1. The update is rolling out gradually, so it might not be available for your country yet. BlackBerry hasn't provided a detailed schedule for, but we hope the release won't take more than a couple of weeks to go global. If you happen to receive the update notification make sure to drop us a line in the comments section below, mentioning your country. A hat tip to Dominic Jaime Martin Sharpe for sending this in!